A busy day today. 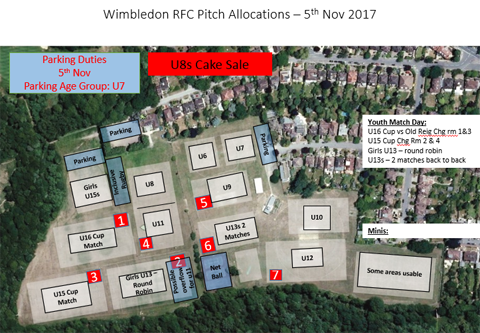 Lots of youth matches. If you're visiting - welcome! - and please follow our parking policy. Specifically DO NOT BLOCK ACCESS TO RESIDENTS' PROPERTIES OR CAUSE BOTTLENECKS THAT COULD CAUSE AMBULANCES TO BE DELAYED. 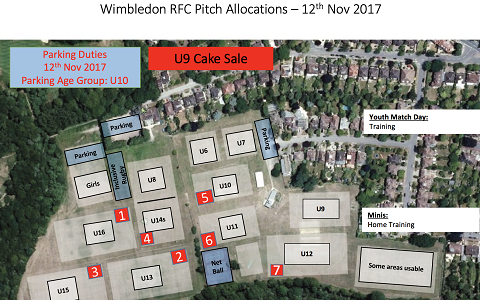 The Year 5 and Year 6 children of Wimbledon Park Primary School were the latest to benefit from “Wimbledon RFC in the Community” when coaches from the club recently spent a day at the school giving rugby taster sessions to over 200 boys and girls as part of the school’s “Health and Wellbeing Week.” In partnership with Zion Sports, the programme aims to encourage and develop new players from non-traditional rugby playing schools, with the coaches drawing on the experiences gained both as players but also from their Sunday mornings with Wimbledon’s Mini and Youth organisation. 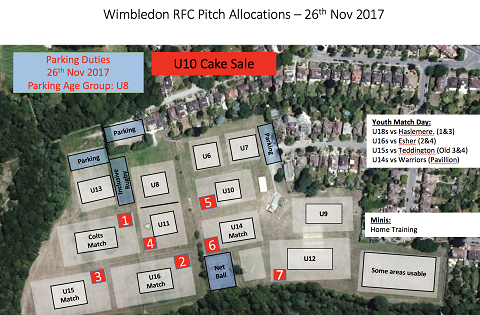 Contrary to the pitch plan below, it's the U11s on parking; no cake sale this week. Have a lovely Sunday and let's hope England put on a better performance against the Aussies than they did against the Pumas. 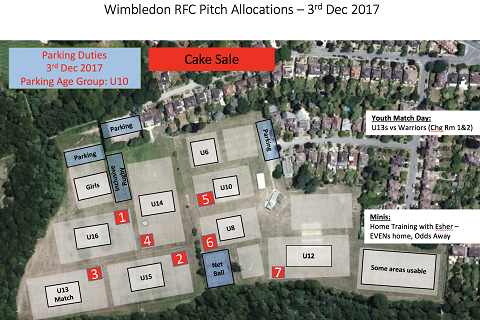 Dates for your diary: youth Christmas party is 3 December (U12-U18); minis is 17 December (U6-U11 and Inclusive). Please make sure your team managers know if you are going to the Christmas parties to help with catering etc. Sport has always been a great way to connect with people. It has the ability to build the strongest of bonds, whether that is through competition or being part of the crowd. 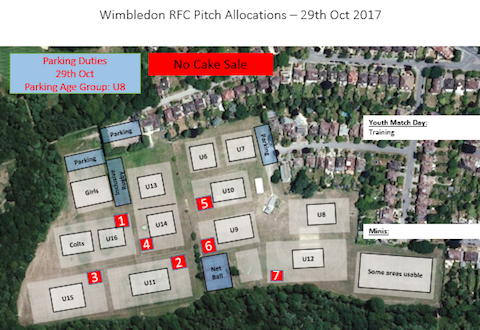 Wimbledon RFC in the Community has been established to give greater focus to our Club’s social responsibilities. We know just how important our role as a community sports club is in keeping people active, healthy and happy and we’re working to be able do more to benefit those around us, year on year. Our initial programme is helping us work with both primary and secondary schools to provide rugby coaching and curriculum-based P.E. to support schools that may struggle to consistently meet the Ofsted required hours of physical activity. We also work with school staff to change the way children can approach exercise, understand healthy lifestyles and help them get the most out of every session, including after school clubs, talks and club days throughout the school year. 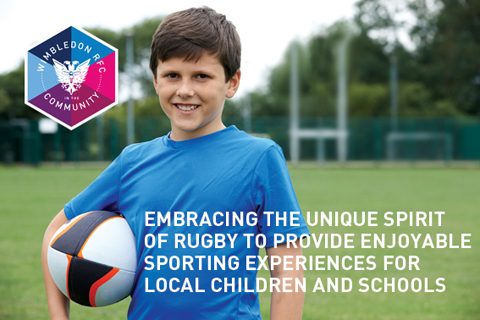 Embracing the unique spirit of rugby and its core values, we believe that we can bring about positive change: helping children learn different skills, forge new friendships, increase their physical activity and ultimately, develop a lifelong love of sport. The wider benefits of physical activity are well known— lowering risks of diabetes, heart disease and obesity; but great coaching experiences can have a profound impact too: building pride, improving behaviour and helping increase attainment. This project is a real and tangible way to take our experience out to a wider audience. To strengthen old alliances, make new connections and further our ambition to be central to a healthy and active community. We have applied to the Aviva Community Fund but we need your votes to help us secure the funding we need. Simply click on the following banner, follow the sign-up process and please allocate all of your 10 votes to our Wimbledon RFC in the Community project. Many thanks. Voting closes at midday on 21 November. With your help, we will be able to provide more than 1,000 hours of coach-led activities for all children in the local community. Start your Christmas with a cracking rugby lunch at Brasserie Blanc on the Southbank near Waterloo. 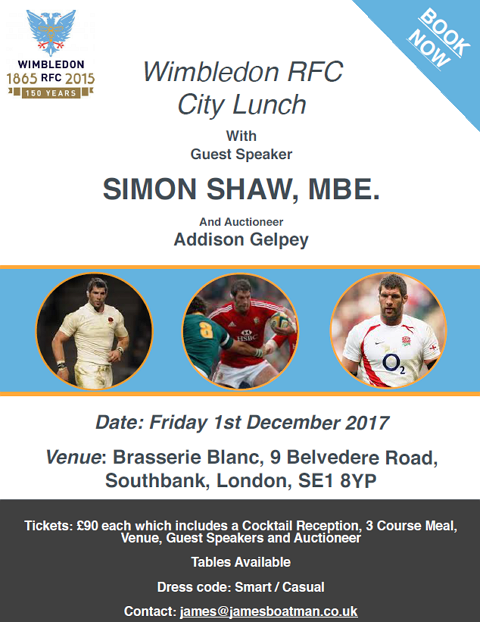 Simon Shaw is on the rugby anecdotes, Addison Gelpey's running the auctioneering.